There are several factors to consider when choosing shrubs for your landscape. The most important consideration is the environment that you will be planting them in. Several environmental factors that may affect the performance of shrubs include the amount of sunlight (full sun, partial shade, shade) the site receives, the moisture characteristics of the site (wet or dry), and the temperatures they are going to be exposed to throughout the year. Each shrub performs best when it is planted in its preferred environment. Planting shrubs in locations with inadequate conditions will greatly reduce their appearance, performance, and longevity. For example, planting a shrub with a full sun requirement in a location that has full shade will reduce the appearance of the plant, decrease the number of blooms produced, and the flowering will usually be delayed compared to the same shrub planted in a sunny location. Also consider the USDA Hardiness Zone designation of each plant before purchasing and planting shrubs into your landscape. This provides an indication as to where each shrub is likely to survive the winter months. Use USDA Hardiness Zone recommendations as guidelines as many factors such as the actual snow cover and moisture levels of each site will also affect a plants ability to withstand cold temperatures. 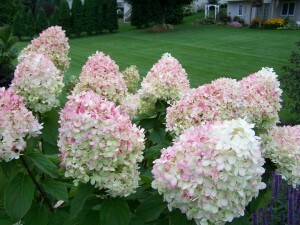 For improved success, choose varieties that are known to perform well in the type of area you desire to plant them in. When planted in a suitable environment, shrubs will prosper and provide you with years of relatively maintenance free beauty. There are numerous ways to utilize shrubs in the landscape and around the home. One of the original and still common uses of shrubs is to hide the foundations of buildings. They can be used to create privacy fencing or as hedges to separate or enclose sections of landscapes or adjacent homes. Shrubs can be used as accent plants placed near prominent landscape features or to add emphasis to that feature. Varieties with significantly showy attributes can be featured as specimen plants or focal points in the landscape. Additionally, shrubs are commonly featured in mass plantings or as containerized patio plants. In the landscape, shrubs combine well with annuals, perennials, and trees, attract birds and wildlife into the garden, and provide structure to winter landscapes.